This week we’re talking all about baby self-feeding. Why, you ask? 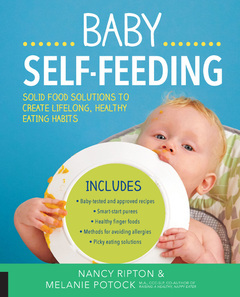 It just so happens Nancy Ripton and Melanie Potock’s new book, Baby Self-Feeding comes out TODAY! We’re so excited about this book. Not only does it include tons of helpful tips, tricks, and recipes, it also helps you helps you encourage your child to be a confident and healthy eater at an early age, like these 7 facts about allergies in young children. Food allergies are common and range from mild to deadly. It is understandable for parents to worry about giving their children certain foods that are common allergens. It can be hard deciding when to give your child certain foods, here are seven tips for allergies and your baby. There are eight major food allergies that young children are at risk of. They are dairy, eggs, peanuts, tree nuts, soy, wheat, fish, and shellfish. These are not the only allergies your child could get, but they are the most common and tend to be the most severe. Allergies were not a very common, and most parents were not typically too concerned about them. The increase in allergy rates could be due to a number of things, one of them being that people are more aware of allergies, there for more aware of even the slightest allergy. This shows the increase very well. Every 1 in 13 children translates roughly to two children per classroom. A child with a food allergy use to be an isolated case in the class or even a school, and now it’s at least one student per class. The over use of hand sanitizer and antibiotics may be making children more susceptible to allergens. They are decreasing the bacteria children are exposed to. A child’s immune system should to be exposed to different bacteria and germs, so it can be trained to know what is harmful and what is good. This early training can also strengthen the immune systems fight against other bacteria later in life. Humans need sun light for Vitamin D productions. Vitamin D is essential to immune system development, and if a child does not produce enough they are at higher risk for allergies. Letting a child, over 6 months of age, have about 10-15 minutes of sun exposure without sunscreen, will be good for their vitamin D production and their health. Avoid midday when sun rays are strongest. Although this use to be the normal consensus of doctors and physicians, there have been studies showing differently. The thought was that high risk foods can be deadly allergies and cause complications. By waiting at least a year the baby’s immune system would be stronger and better able to handle a stronger allergic reaction. A recent study shows that kids introduced to peanuts between the ages of 4 and 11 months actually decreased their risk for developing a peanut allergy. It is likely for a child to grow out of a dairy, egg, or soy allergy by the time they hit puberty. These allergies usually start in childhood and can stay or dissipate by the early teens. It has been shown however that allergies to peanuts, tree nuts, fish and shellfish are often allergies for life.